Space-based technologies and data are vital to the goal of global sustainable development, a fact that is well-recognized by a myriad of international bodies and through important conferences, none more so than the United Nations Conference on Sustainable Development in 2012. More and more satellites are launched into space almost weekly by a growing number of space-faring nations. These numbers, the result of significant investments and efforts, demonstrate the importance of these technologies for a wide range of societal benefit areas, for both developed and developing countries. The recent establishment of the Group on Earth Observations (GEO), in 2005, and the rapid growth of its membership and interest from many countries with no space technology capabilities, further supports this evidence. This Group aims to build the Global Earth Observation System of Systems (GEOSS) with the aim to enhance the relevance of Earth observations for global issues. In spite of the rapid growth in such cooperative efforts, only a small percentage of the 200+ countries in the world have adequate access or capacity to work with space-based technologies and data, due to technological or resource limitations and often a lack of capacity awareness. This has become more evident in recent years, especially when such visionary programmes as Landsat paved the way for a large amount of space-based data to be released into public domain, while many experts around the world lacked awareness and/or ability to access such assets. And unfortunately, this issue still exists. 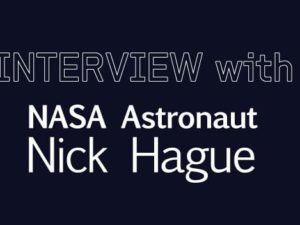 The United Nations Office for Outer Space Affairs (UNOOSA) aims to support countries in this respect and bring the benefits of space technologies for sustainable development in an equal way to the broadest spectrum of nations. The Office, through its Programme on Space Applications and Platform for Space-based Information for Disaster Management and Emergency Response (UN-SPIDER) assists these countries to build their capacities for accessing and working with satellite-based data and information and in developing indigenous space technologies. See related columns, Secure World Foundation Forum here, and On the Edge here. Globally, capacity-building efforts in space technologies are supported by numerous international organizations and United Nations entities, and the variety of actors and offered programmes have increased in conjunction with advances in space-based technologies and the wider availability of space-based data and derived information. Under the United Nations family of organizations, entities provide such support, within their respective mandates, and for their government clients, for humanitarian, food security, crime prevention, disaster management, and environmental monitoring and assessment purposes. In addition, the commendable efforts by a few visionary private entities in particular in the last ten years have made space-based data accessible to the public through their significant investments into the accessibility of space-based data (satellite imagery) and applications permitting greater familiarity with the availability and benefits of space-based data. One example is Google Inc., which has taken the then little-known specialized software tool Keyhole and transformed it into the universally, and freely available Google Earth application. 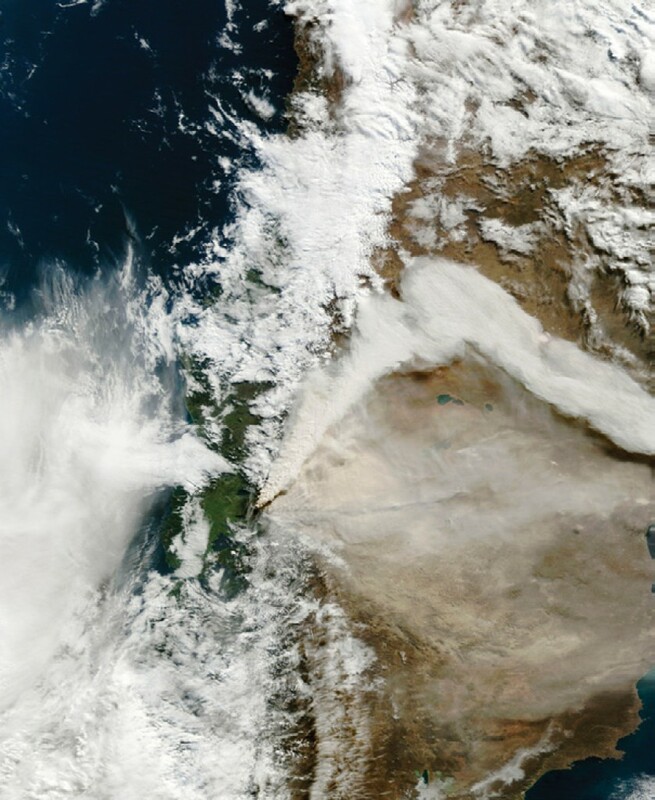 Huge ash plume caused by an eruption of Puyehue-Cordón Caulle Volcanic Complex in Chile just west of the Argentinian border in June 2011, courtesy of NASA. If there is a more equal playing field in terms of access to space-derived data, it is thanks to strategic and crucial decisions to make the data public (more in the mid-resolution range such as Landsat or CBERS, but also high-resolution data such as OrbView-3, older SPOT panchromatic imagery or older declassified spy satellite imagery). This led to a growing interest and demand for training on how to work with such data and on how to derive information from it for more informed decision-making and for varied uses. It is in this context that UNOOSA was and is delivering on an important component of its mandate through the various capacity- building activities and efforts, in the framework of the Programmes it implements. UN-SPIDER Training Advisory Support mission to the Dominican Republic, for an inter-institutional team on geospatial information for disaster-risk management and emergency response, courtesy of UNOOSA. Through UNOOSA’s Programme on Space Applications, established on recommendation of the first United Nations Conference on the Exploration and Peaceful Uses of Outer Space (UNISPACE), held in 1968, the Office has been active since the 1970’s organizing a series of annual training activities and workshops in various countries to promote the use of space technologies for environmental aims, sustainable development and disaster management. UNISPACEII, in 1982, broadened the mandate of the Programme and paved the way for a number of Regional Centres of excellence to be affiliated to the UN. These Centres have the long-term goal of aiding sustainable development by building indigenous capabilities for research and applications in space technologies for developing countries. The Centres offer annual courses (similar to degree courses) to select students of developing nations and, together with UNOOSA, financially support their participation, thus enabling widespread participation. 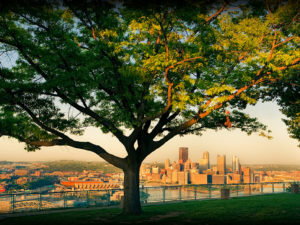 Students undertake rigorous theory, research, applications, field exercises and pilot projects under the guidance of university educators and scientists in the core disciplines of remote sensing and geographical information systems, satellite communications, satellite meteorology and global climate, and space and atmospheric sciences for sustainable development. The Centres benefit from education curricula in each of these core disciplines, developed by UNOOSA with the support of prominent educators. The curricula can be found of prominent educators. The curricula can be found at the website of UNOOSA. As a result of the recommendations arising from UNISPACEIII in July 1999, the UN General Assembly established the United Nations Platform for Space-based Information for Disaster Management and Emergency Response (UN-SPIDER) programme in 2006 (General Assembly Resolution 61/110, A/RES/61/110). UNOOSA has carried out a number of targeted capacity-building activities in the domain of space technologies for disaster management since 2008. These activities most often take place as a follow-up to thorough UN-SPIDER technical advisory missions carried out in a number of developing countries on invitation by their governments. 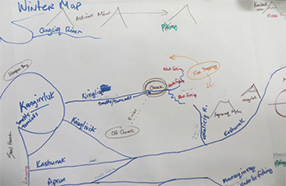 These activities provide targeted training and support for selected staff from local government, academia and international organizations, to address gaps in the exploitation of space technologies and space-based data for disaster management within a national context. In conformity with its mandate, UNOOSA has also been a long-time active Associate member of the Committee on Earth Observing Satellites (CEOS), established in September 1984 to coordinate and harmonize Earth observations to make it easier for the user community to access and utilize space-derived data. The Office is involved in the Working Group on Information Systems and Services (WGISS) under CEOS and co-chaired and played an important role in the former Working Group on Education (WGEdu), followed by current participation in the Working Group on Capacity Building and Data Democracy (WGCapD) http://bit.ly/1sUY0EE. The Office also joined GEO as a Participating Organization and has supported various GEO capacity- building and awareness-raising efforts, as well as the “Data Democracy” and data sharing principles development work. The Office has recently strengthened its relationship with GEOS and intends to work more closely together in the future on issues of mutual interest. Recently, Office staff have contributed to the development and delivery of a WGCapD e-learning introductory course on Remote Sensing, targeting existing students from various developing countries. Staff also gave presentations and lectures at Summer University for post-graduate students on the benefits of space-based data and technologies for environmental monitoring and assessment at the Central European University in Budapest, Hungary. 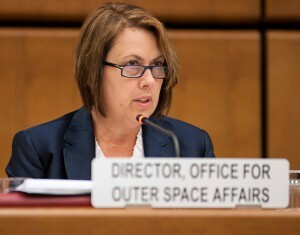 UNOOSA also sup- ported capacity-building efforts under the Eye on Earth initiative (http://www.eoesummit.org/). These efforts are essential for UNOOSA to ensure delivery of its mandate. An overview of future workshops and training sessions being planned at this time can be found at the Programme on Space Applications Activities schedule web page (http://unoosa.org/oosa/ en/sapidx.html). Climate change has led to more severe weather phenomena and heightened the risk of disasters. As such, disaster management has become a highly-relevant topic, with decision makers constantly seeking ways to mitigate exposure to disasters of communities, to invest more into prevention and early warning, and to reduce economic losses and loss of life in disaster situations. The establishment of the UN-SPIDER Programme expanded the work of UNOOSA into specific capacity building and training in the use of space technologies for the full disaster management cycle, from early warning to recovery. This includes not only Earth observation data and derived information but also the use of global navigation satellite services and satellite telecommunications. This work is made possible largely thanks to multi-year voluntary contributions made to the Programme by the Governments of Austria, China, and Germany, with further support provided by Croatia, Indonesia, the sixteen institutions and countries hosting UN-SPIDER Regional Support Offices and the individual experts who contributed to the missions. 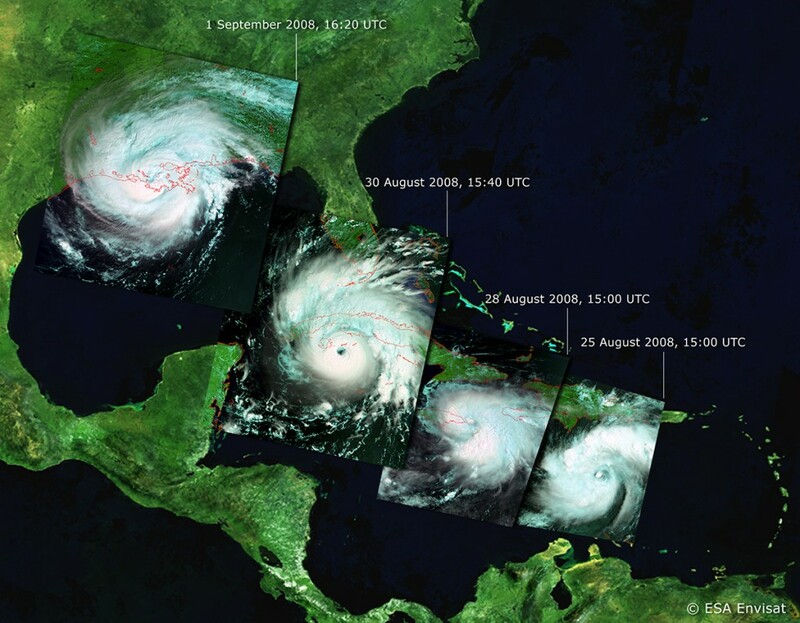 Satellite images of Hurricane Gustav as it approaches the United States in August and September 2008, courtesy of ESA. UN-SPIDER Technical Advisory Missions (TAMs) have visited over 25 countries where the TAM expert teams identified specific needs for training. These recommendations often lead to the organisation of follow-up capacity-build- ing workshops run by the Office in the country in which the TAM took place (most recently in Cameroon, Mozambique, Nepal, Sri Lanka, Sudan and Vietnam). These workshops typically bring together 40-50 participants from local civil protection and disaster management authorities, relevant national government entities, staff of local academic institutions supporting the government with disaster management and in-country UN staff. Topics are chosen relevant to the needs of the country, to provide practical training on software tools, remote sensing data processing and GIS techniques applicable in disaster situations and rapid assessments, and on the methods to identify and download relevant free satellite data or derived products. 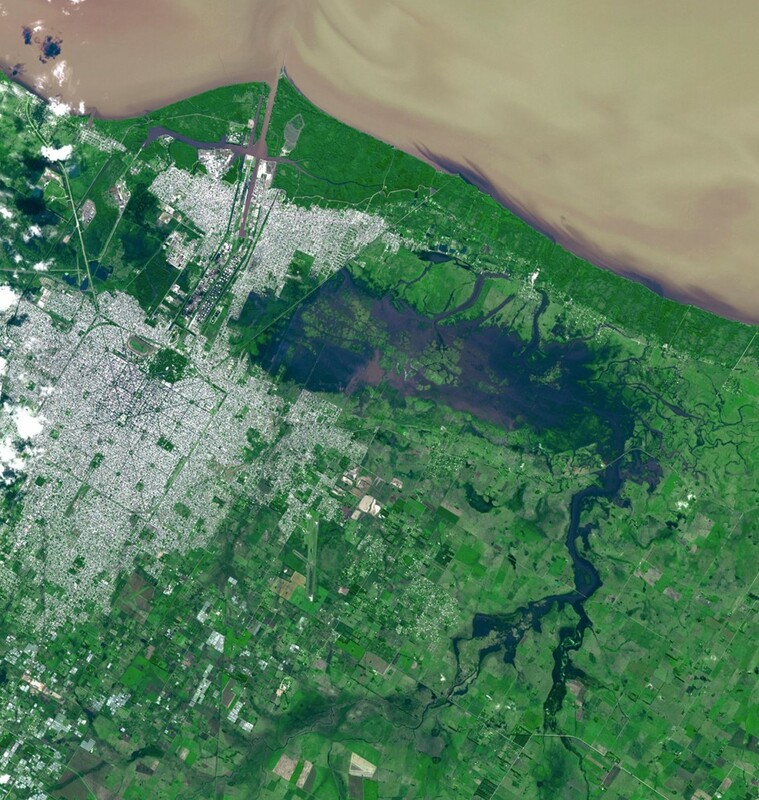 Flooded area in La Plata, Argentina in April 2013, courtesy of NASA. UN-SPIDER efforts in training and capacity-building provide the local population with the skills to access data analysis techniques and sources of space-based data. Participants are made familiar with the process for requesting specialized support from the International Charter, Sentinel-Asia, GIO or other support mechanism activations, and on how to access data and online modelling tools and services. The local experts also build up their global network including through the UN-SPIDER Regional Support Offices. This capacity-building component will continue of course, but it remains dependent largely on available voluntary contributions to the UN-SPIDER programme (currently very limited compared to many other UN initiatives resourced by voluntary contributions), as a large number of existing TAM recommendations remain unimplemented, while more developing countries request such advisory missions to evaluate their own capabilities and processes. As the 2015 deadline for the Millennium Development Goals approaches, the UN and its Member States are galvanising their efforts for the post-2015 development agenda in a process initiated at the Rio+20 Conference on Sustainable Development. Member States agreed to work on a process that would culminate on a set of Sustainable Development Goals (SDGs). 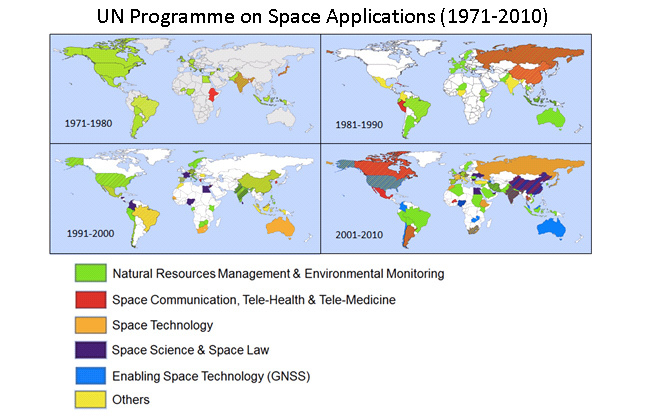 UN Programme on Space Applications Global Map, courtesy of UNOOSA. 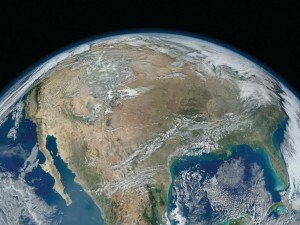 At this critical time, when the world shapes these Sustainable Development Goals and formulates the global development agenda in the post- 2015 context, the momentum from the Rio+20 Conference has lent a heightened awareness of the contribution of space technology for sustainable development. The establishment and strength- ening of sustainable and standards-driven spa- tial data infrastructures merit recognition as an important means of implementation of those development goals and objectives. UNOOSA has a unique opportunity to mobilize support and commitment at the global level for increasing the role of space-based technology and information as an enabler of the goals and objectives of the post-2015 development agenda. Through its capacity-building activities, UNOOSA can ensure that equality in the fundamental access to space-derived information and its use in supporting decision making at all levels is guaranteed in the work towards global sustainable development.